Probably you can recall that there were moments in your life when time seemed to stop, everything around you just froze and you were riding this wave of creativity where everything was possible; you felt like you can accomplish anything, you were so immersed in what you were doing that all of your senses were focused and sharpened on that one particular activity, and your body excluded everything else? Fun and exciting in the same time, right? And today it might seem harder to achieve that creative bliss we are all looking for, since we are so distracted and interrupted with everything going on around us. 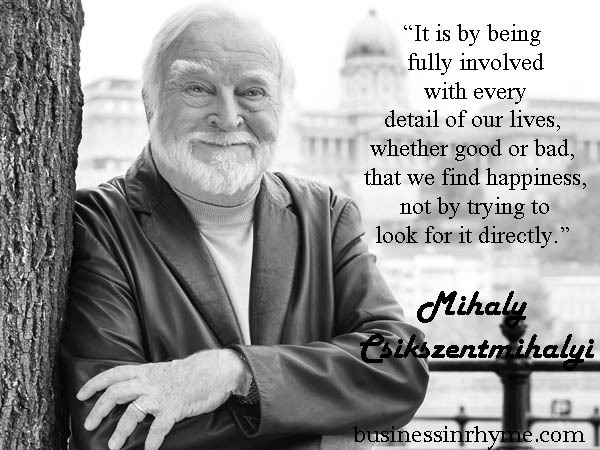 In this TED talk Dr. Csikszentmihalyi, explains that our nervous system is incapable of processing more than 110 bits of information per second. If you’re listening to someone talking, you need to process about 60 bits of information per second in order to understand what they’re saying. He further points out that when you are doing something with high focus, your mind don’t have enough room to process other information concerning how you feel, bodily functions or other needs. Creative people often call this as the entering the state of flow and like nothing else except what they are creating exists. So how can you enter the ‘flow’? Can it be practiced? How can we use it to improve our creative skills? As you can see on the above graph, the state of flow is dependable on the level of skills you use and the level of challenge you pursue. 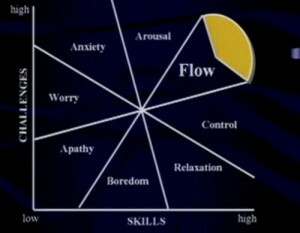 The higher the challenge and the more skills we need to engage, the better chance we have for entering the sate of flow. The self-awareness is concentrated on the present moment. It’s interesting to note that this research was performed on the topic of happiness and what makes people happy. Simple answer came out to be: being creative and enjoying it as much as possible. So how can we use these key findings and apply them to our writing? How can we practice entering the state of flow? Pick an enjoyable, yet challenging activity with clearly defined goal. Since we are talking about writing you can chose to write a poem that has certain amount of words, poetic form that is new to you, story on the topic you need to do further research and inquiries – something that goes beyond your ordinary writing practice. Remember that here you need to be fully engaged and use your skills. The challenge you pick can also help you enhance your capabilities, so don’t be afraid to go overboard of your usual writing. Play with words and dictionaries, learn foreign phrases – all that helps you become more creative and inventive in writing. Remove distractions as much as you can. Once you enter that creative flow, if something interrupts you, the harder is to go back in and continue. So clear your desk, turn off your phone and concentrate on the task at hand. Let go of any past experiences that might influence your expectations and results of the activity. Mastering that flow mindset takes time and practice so be gentle towards yourself and monitor your emotional response. You are in control of your attitudes so if you get too excited (angry, anxious, worried), calm down and try to regain your steady levels of energy: being sluggish and bored is also a sign that you fell of the ‘flow wagon’. to work on a poem, a story, a chapter, an article in a continual interval – for example 30 minutes, and give all you’ve got. Focus on your writing and you’ll see how time will past in split second. Make it a regular habit. Getting into the flow and enjoying the activity that brings desired results takes practice, so make it a part of your daily routine. Schedule your ‘ time flow’ every day and commit to it. Not only are you working on your creativity and skills, but you are improving your mood and bringing more happiness into your life. After all, isn’t that what we all are looking for? It’s worth a try. April 11, 2016 April 11, 2016 by Maja Todorovic, posted in Business in Rhyme, Read, write, lead!, Write, create, innovate! Hermann Hesse’s life and literary quest was always preoccupied with constant search for meaning of life and faith. He was born into a Protestant-Pietist family of missionaries, preachers and theologians, but somehow Christianity didn’t offer him answers he was looking for. Soon, very much influenced by Hinduism, Buddhism and Taoism, he developed his own notion that humanity actually belongs to some kind of Universal truth that goes beyond any religion and metaphysical explanation. 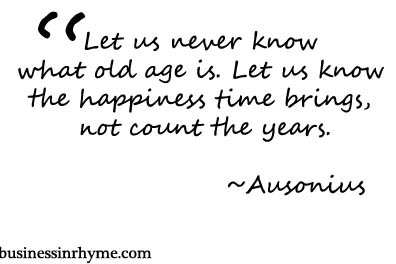 In most of his work, especially in his spiritual poetry he always emphasized the importance of living in the now: on letting go and finding contentment within ourselves. Whenever in doubt, he invites us to look in nature, observe the flow of life that goes around us and how we are part of that life. It is upon us to say yes to life, to affirm that we are part of some eternal life force and intelligence bigger than us; that we need to trust life and ourselves. Life is not good or bad. It is what it is. If we dislike something it is mirrored part of ourselves that we don’t like. When it comes to writing, if it is something we really want to do in life, we will find the way to work for us. Once we recognize that we have that gift to share with world, gift and value of our own vulnerability, that we accept and admire it with all virtues and flaws – that is real happiness. Words can be seen as our proof of existence and how we use them makes the whole difference. “You must find your dream, then the way becomes easy. Happiness is a how; not a what. A talent, not an object. Without words, without writing and without books there would be no history, there could be no concept of humanity. I hope that his thoughts will help you and inspire you in your further creative endevours. 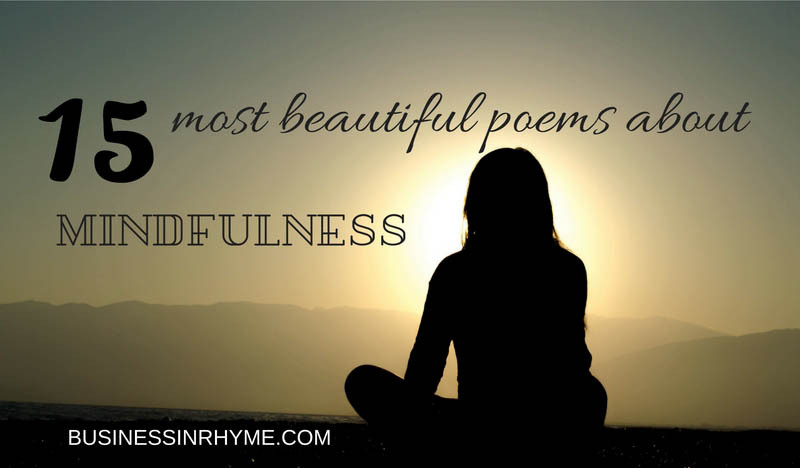 You can complement this reading with Mark Strand’s take on creativity, what writing haiku can teach us and little tips on how to develop your own mindfulness practice.